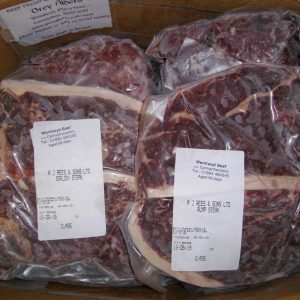 Scroll down for information about our beef. Here’s some wonderful rump steak! Our aim is to bring you the best beef and mutton you will ever taste. The secret is (1) older animals, (2) grass-feeding and (3) super-ageing after slaughter. Wernlwyd (Eng: Grey Alders) is not certified organic but we employ organic principles. Our pasture has not been reseeded for years, most of it for generations. Over that time it has become naturalised with wild grasses and flowers. That brings higher welfare and improves quality. We look for a minimum of five years of age before slaughter. That’s twice as old as most beef around. Slow growth means a better joint of meat. Not only that, but we hang each side of beef in the chiller for no less than fifty-six days. At that point something extraordinary begins to happen. The increase in tenderness is dramatic. The taste becomes deeper and more complex. The meat enzymes have done their work! We begin to approach, if you will forgive the expression, ‘meatopia’. Contrary to what you might hear, environmentally the impact of raising sheep and cattle is low. 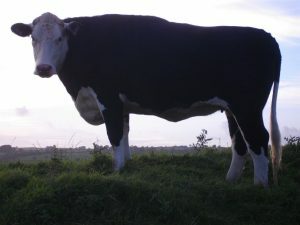 Our animals hang out in fields during the summer and eat silage, harvested grass, in winter. They are NEVER ‘finished’ on grain in ‘feed-lots’. After all, sheep and cattle are grazing animals. Their ruminant digestive system has four stomachs, far more complex than ours. They are inefficient at digesting grain but perfectly-designed to extract every last ounce of nutrition out of grass and meadow flowers. 26% of the earth’s surface is pasture. By the grace of God ruminants convert what we cannot eat slowly but surely into something for our table we can delight in. Here’s another point. These days produce can be flown half-way around the world to satisfy modern food fads. When you choose our super-aged beef or mutton, you are buying local, from farm to fork, and keeping those food miles to the bare minimum. Our meat costs no more than what supermarkets charge for their highest quality. But the similarity ends there. 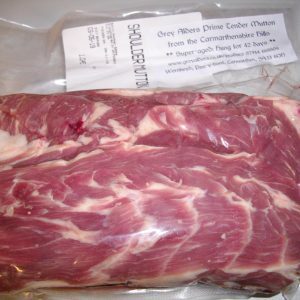 Older stock means more flavour and longer hanging brings vastly improved taste. By buying direct from the farm, you know what you are eating has been well cared for. And we know our customers appreciate the very best. This is your classic Rump Steak. We sell it in a pack of two. It might not be quite as tender as our sirloin steak, but you can still keep those ‘steak knives’ in the drawer for this flavour-filled protein-packed delight. 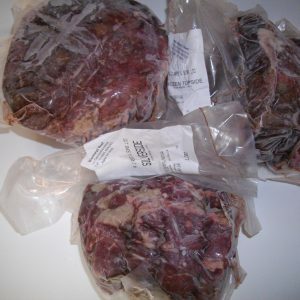 Joints range in weight but average at 0.465kg per pack giving you two steaks on average 8oz each. Our rump steak is £21.76/kg (£9.87/lb) Order online now for collection in Carmarthen Farmers Market or Llanelli Steet Market. Or why not turn up to collect and see the farm? 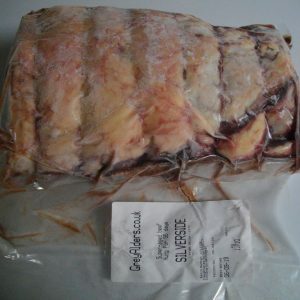 Sirloin & Fillet Steaks, Beef Forerib, Roasting Joints, Silverside, Brisket & Slow Roast, packs of Beef Mince, Diced Beef and Boxes of Beef are also usually separately available. To say nothing of our super-aged mutton!